Chipotle, Apple, the FBI, and Yelp are all working public relations from different angles — some proactively and some reactively. Reactive is the worst because when possible, companies want to drive their own narratives with proactive public relations. This can be accomplished in the slow-but-steady growth of your brand through solid earned media, beyond just the traditional mediums. 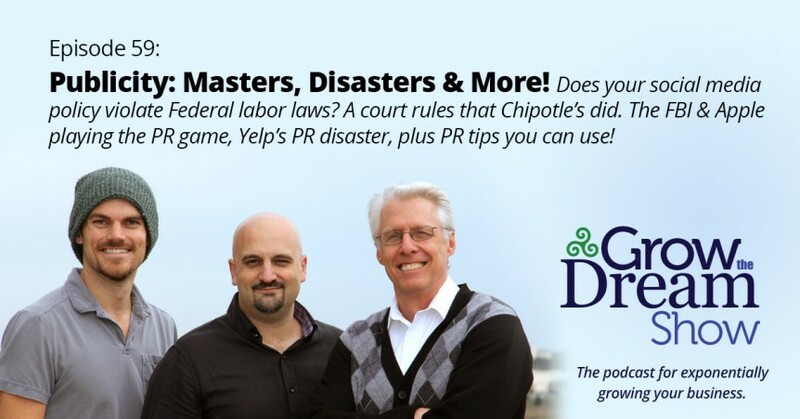 But when bad PR is coming at you like a train — like, say, Chipotle’s — there are some things you can do minimize the damage. Last week, a judge ruled that Chipotle’s social media policy violated federal labor laws (Adweek) after it cited the policy when firing an employee who bashed them on Twitter. He decided to take his back wages in food vouchers. Speaking of disgruntled employees, Yelp had its own PR nightmare when 28-year-old Talia Jane wrote an open letter to the Yelp CEO on Medium. Business Insider carried the response of another Millenial who took Ms. Jane to task for her life decisions. Yelp CEO Jeremy Stoppleman responded on Twitter after the company fired Ms. Jane. Be sure to tweet Josh Muccio and let him know you missed him this week! Click here to watch this episode on YouTube!